If you don't want to subscribe via e-mail for fear of waking up to a stuffed inbox every morning, sign up for Feedly. It's a free service that allows you to import your Google Reader data into and check just like you would Reader! Hopefully you're able to see my blog right now. I attempted to make the switch from Blogger to Wordpress over the weekend and it turned into a big ol' nightmare filled with lots of tears and heartache. I was able to switch back to Blogger late last night so it should look like nothing changed but if you see anything odd (assuming you're seeing this at all), please let me know! Why did I attempt to switch? It all happened when Google announced that they'd be getting rid of Google Reader - we'll get to that in a second. I was up late Saturday night and started thinking that if they were taking Reader away, maybe they'd take Blogger away too. I basically panicked and went into a complete tailspin. Within a matter of minutes, I had signed up for some hosting, installed Wordpress, bought a few themes for it, and then attempted to modify them into what I wanted my "new" blog to look like. Anyway, back to Google Reader going away. Last week Google announced that they were going to be retiring it because its "usage had declined" over the years. You can read the whole article here if you're interested. What does that mean for you? 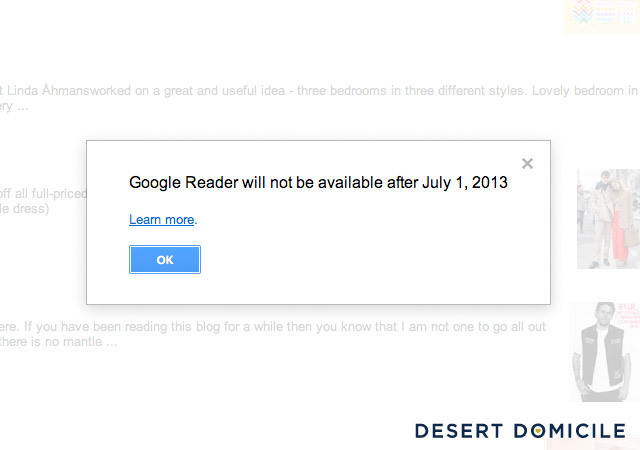 Well, it means that if you're reading my blog in Google Reader, you'll no longer be able to as of July 1. I don't want to lose you as a reader but Google doesn't care about that so if you ARE reading my blog in Google Reader, or have added it to your reader previously, and want to continue reading it after July 1, you can either bookmark my blog's URL (www.desertdomicile.com) or subscribe to my blog via e-mail. The difference between those two options is that if you just bookmark my blog, you'll have to check the bookmark every day or week (depending on how often you frequent my blog) to see if I've posted something new. If you subscribe to my blog via e-mail, you'll receive an e-mail every day I post something new and then from your e-mail, you can click on a link in the e-mail and it'll bring you to my blog! 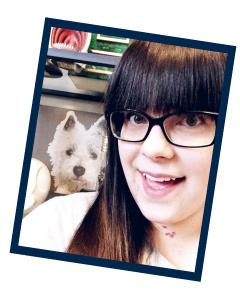 Another way you can follow my blog is through Blog Lovin'. I tend to mention my latest posts on Facebook too so you could always like my page to stay updated that way as well. Hopefully that gives you plenty of options to keep on reading because I'd hate to see you go! That is some scary stuff. I've been wanting to make a switch but am scared and now you confirmed my fear. Ugh! I'm so annoyed with Google! Yeah it sucked but at least things seem to be back to normal. 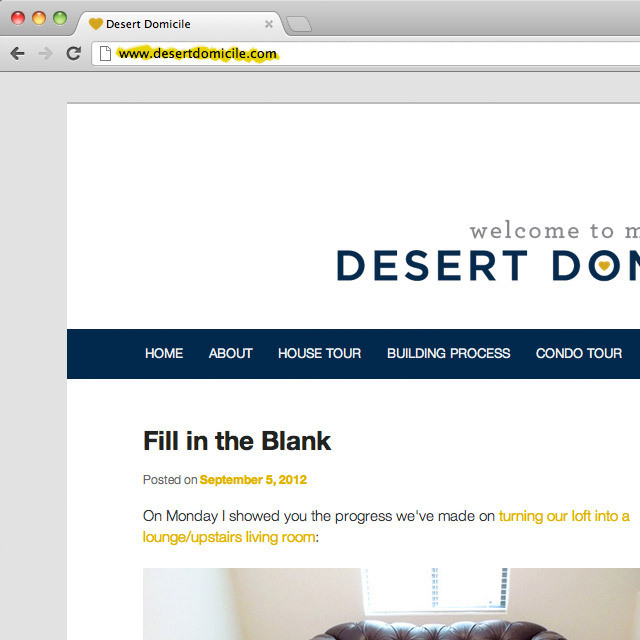 There's a few issues here and there but I think things with the hosting company are still processing/cycling through. The only way I'd ever attempt to switch again is if I was paying someone to do it for me haha Fingers crossed Blogger will be around for a while so that doesn't have to happen! Oh man I did stop by yesterday (mentioned you in my blog post for today and wanted to link you up) and it didn't look good. I figured you were sitting behind your laptop working like crazy to get everything back up. Glad that as far as I can see everything looks like it is back to normal! You bethca. when you are in the summary type view just click on a picture and it will bring you to the frame view - then you can click next to just scroll through the pages. It's quite handy....and it counts as a page view! I was quite distraught when that notification popped up! Thanks for the info.